Compassion investigators have just reached the site of the Gadhimai slaughter festival in Nepal. In a few short hours, the mass sacrifice will begin. 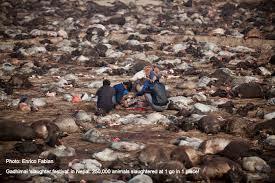 For months Compassion campaigners have been working tirelessly to stop the inhumane slaughter at Gadhimai festival. Many of you demonstrated alongside Joanna Lumley outside the Nepalese embassy in London earlier this year. And by joining forces with like-minded organisations and individuals around the world we’ve turned what was a local issue into a global issue. Please, tell the Nepalese Government: Never again. This entry was posted on 29 November, 2014 in homepage and tagged Barbaric religion, barbarity, Compassion in World Farming, Heidi Stephenson, Hindu massacre, Joanna Lumley, mass killing, Nepal, Pru Elliott, The evil Gadhimai massacre. Bookmark the permalink. This horrific atrocity – which has caused such immense and terrible animal suffering, and on a scale which is just unimaginable – must never be allowed to happen again. Our fellow, sentient beings have natural rights: to their lives and to freedom from bodily harm – just as much as we do. Would we want to suffer this? No. Do as you would be done by. The Golden Rule: and “golden” with good reason.